In any discussion on quality teaching and learning, physical classroom environments are often given surprisingly little attention. This is all the more surprising, given the fact that in the field of pre-school education sound theoretical conceptions have been developed decades ago through which environmental aspects of learning can be analysed. One could think, for example, of the ‘prepared environment’ of Maria Montessori, as well as Loris Malaguzzi’s concept of the environment as ‘third educator’. These conceptions can also be applied to learning in the primary school. From an ethnographic point of view the design of classrooms can be interpreted as a physical representation of the culture of the school which is embedded in the culture of a country at a given time. 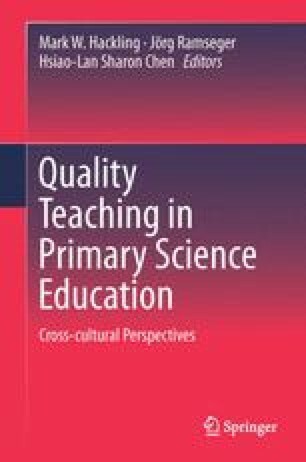 Questions derived from three theoretical conceptions will be used in this Chapter as instruments to explore and analyse both visible aspects and possibly hidden meanings of physical classroom environments in select cases from diverse cultural settings in order to gain insight into the impact of classroom environments on quality primary science teaching. Data are drawn from case studies in Germany and Australia on forces and in Taiwan on the movements of the Moon. The Chapter describes the physical layouts of the classrooms, their facilities and equipment, and then explores the manner in which the teachers used the physical layout as well as artefacts to create learning environments for contemporary science education. The constraints and affordances offered by the different environments will inform implications for policy and classroom design.